From Goodreads: Spending time with Elliott instills a faint whisper of hope within Sophie Young; hope that both terrifies her and promises redemption. But the demons of her past are never far behind, and old habits are hard to break. The more she tries to push him away, the stronger the pull towards him becomes. As Sophie’s broken heart continues to seek comfort in Elliott, can she put aside her destructive ways and take the most dangerous risk of all? For many years, Elliott Dalton had lived a solitary existence, keeping his emotions under tight control. But as his feelings for Sophie grow and her life spins further out of control, his carefully built facade begins to crack. My Thoughts: Smith’s writing is so brilliantly natural, raw and beautiful. There was nothing about the narration in this story that felt forced or contrived and I think that is why this book affected me as much as it did, it was just so unbelievably real. Smith wrote Sophie and Elliott’s characters with such authenticity that it literally hurt me to read their stories at times. I did not feel as though I was reading a novel, I felt like I was watching these two kids try to come to terms with their past traumas and understand how they were affecting their present lives. 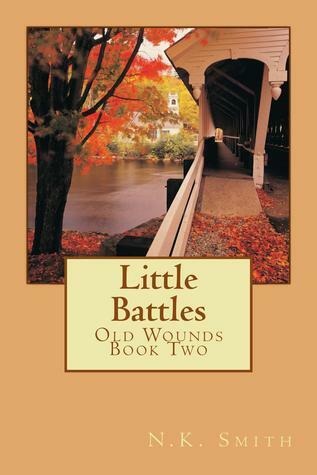 In Little Battles we as readers are given a painfully close look at Sophie’s past and how it has affected every detail of her life, from her drug use to her inability to be close with anyone. The explanations given for Sophie’s behaviors and attitudes are heart wrenching and I couldn’t help but feel for this girl. What was so interesting to me is how Sophie and Elliott were able to connect with each other when they either had difficulty or no desire to connect with others. How Elliott’s character developed and changed surprised me and throughout the novel I was dying to read more about him. There was so much that he wanted, or needed to say, but just couldn’t. I am absolutely sitting on pins and needles waiting for the 3rd installment of this series Weight of the World to come out on August 25, 2011! I think that this is the book that will give me the answers that I so desperately crave about Elliott. I am giving Little Battles 4 Hands and Home stamps of approval!